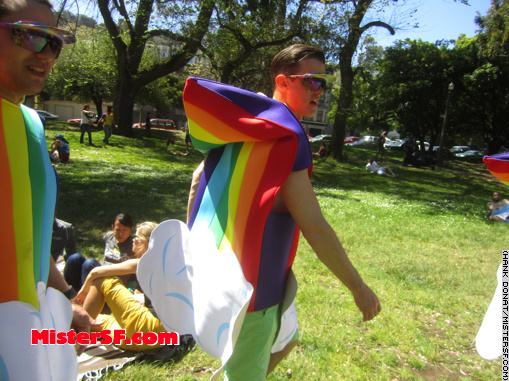 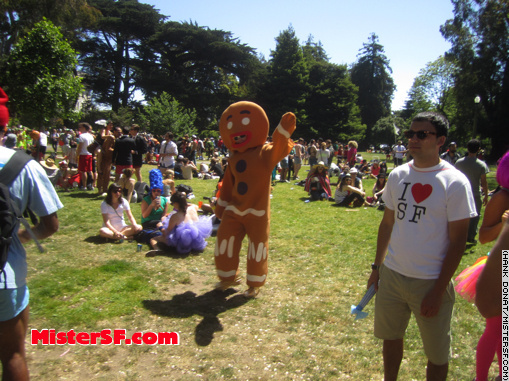 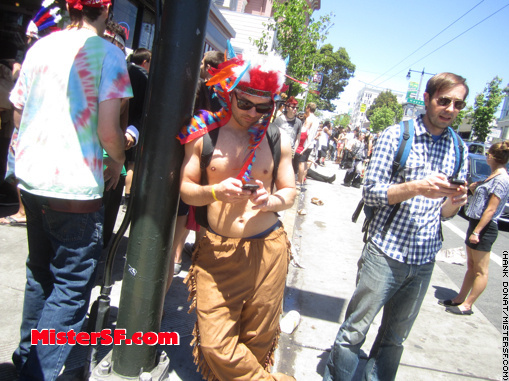 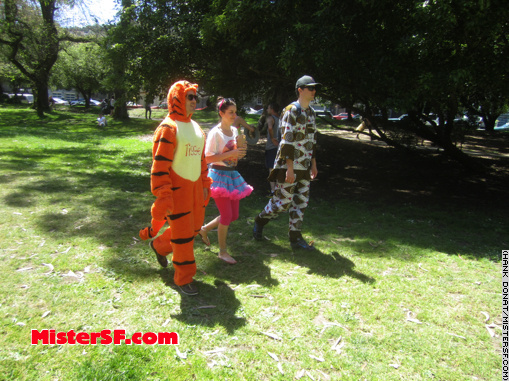 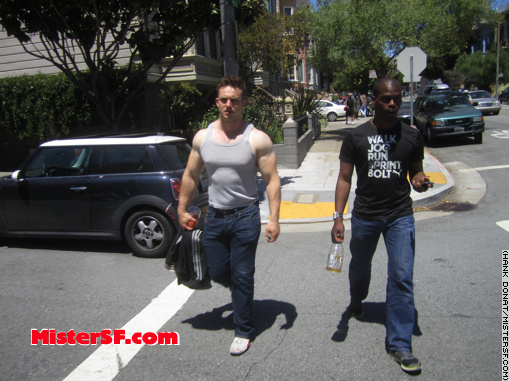 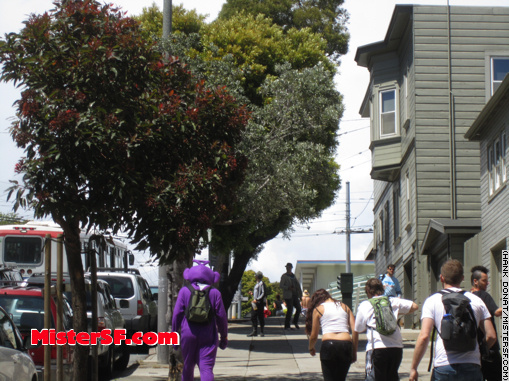 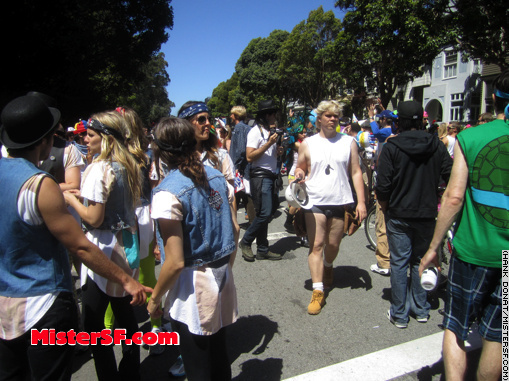 Dateline: The Panhandle, Fell Street between Baker and Clayton Streets, where Mister SF takes a sunny, hunky slide through Bay to Breakers. 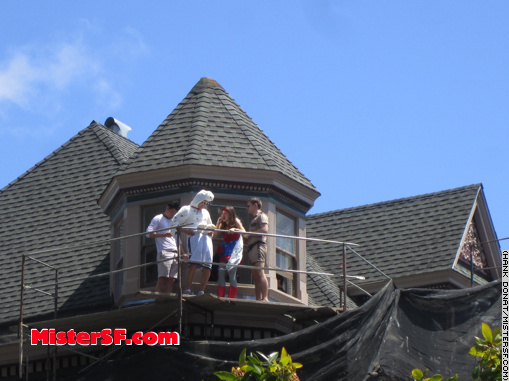 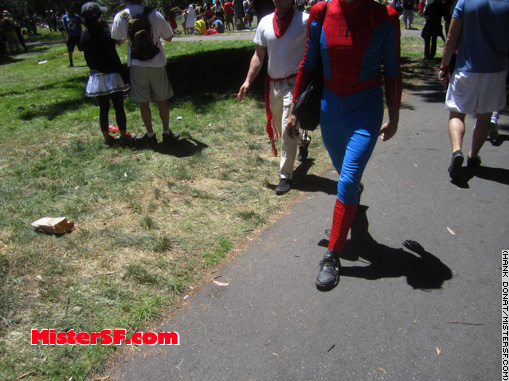 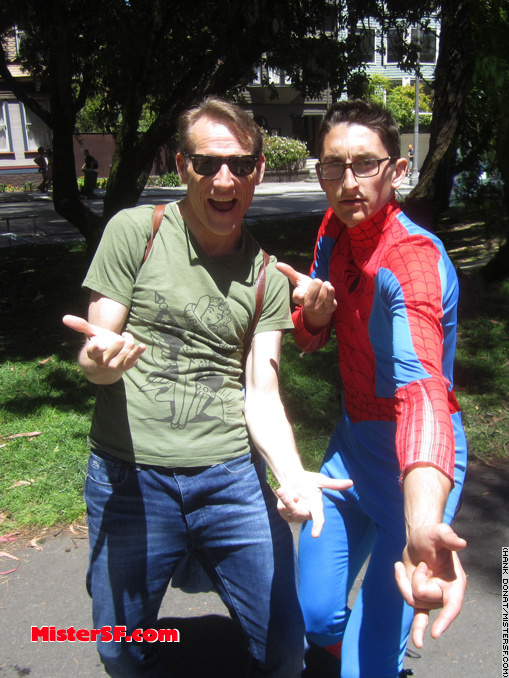 Mister SF and Spiderman swing through the Panhandle. 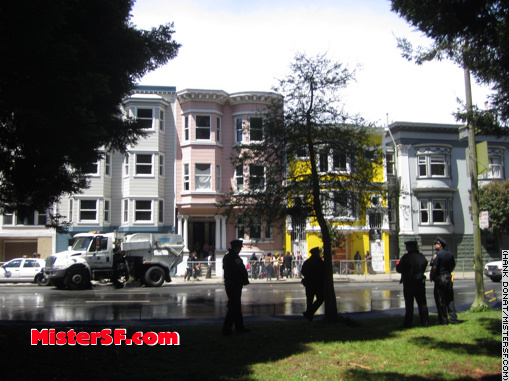 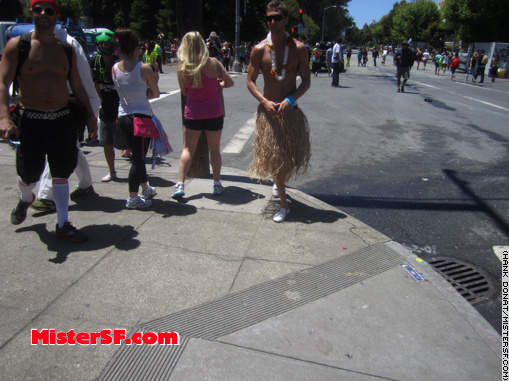 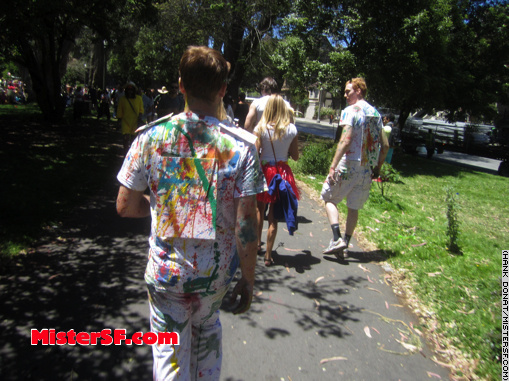 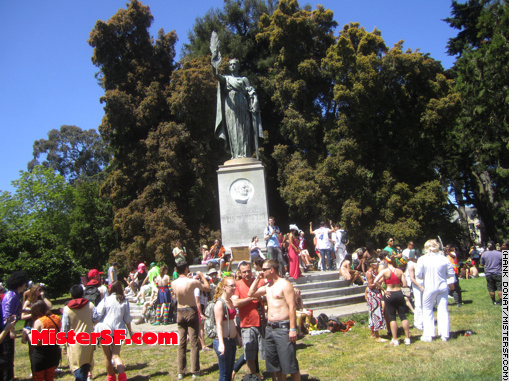 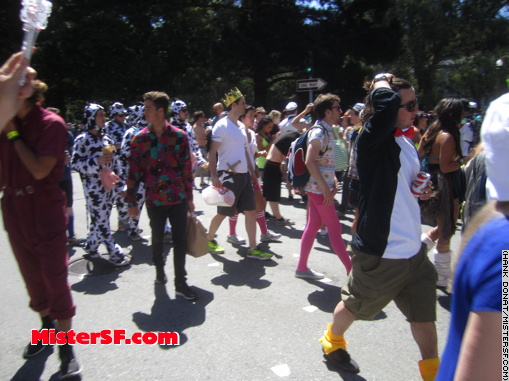 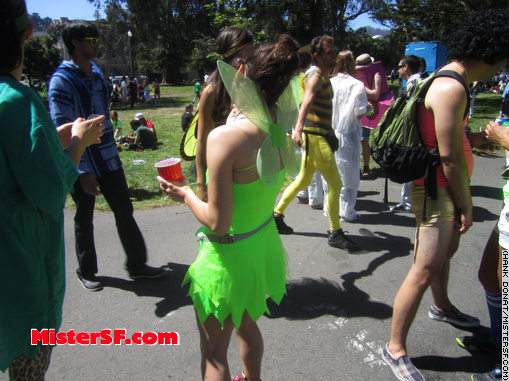 With or without any of its Examiner/Albertsons/ING/Zazzle prefaces, the SF institution known as Bay to Breakers can be seen from hill to hill and always through many lenses. 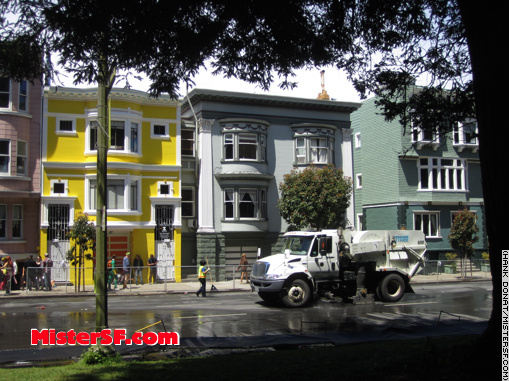 For the 50,000 athletes racing in the annual 12k – 2012 marks the 101st year – the event offers an unforgettable urban course made more exhilarating not only by its swath through San Francisco but also by the added challenge of Hayes Street Hill. 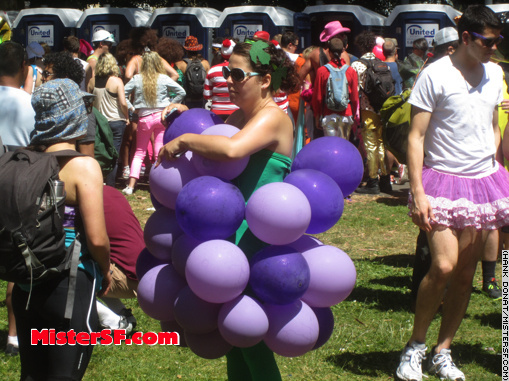 For thousands of other revelers, the third Sunday in May is just another fantastic opportunity to party in disguise. 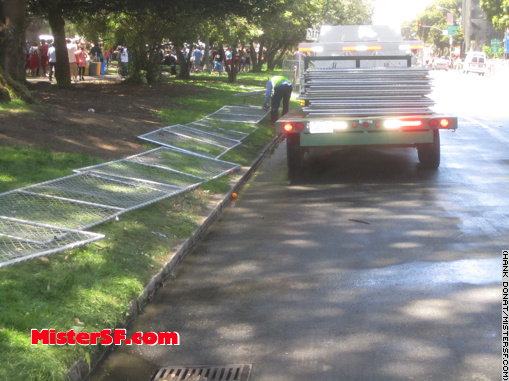 Residents in neighborhoods along the Bay to Breakers course from the Embarcadero to Ocean Beach have long endured the hazards of its wake – vomit, “wee and poo,” and property destruction. 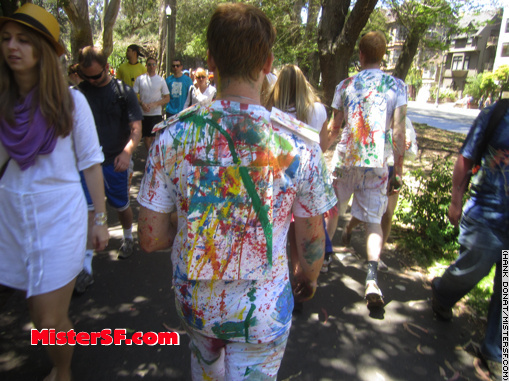 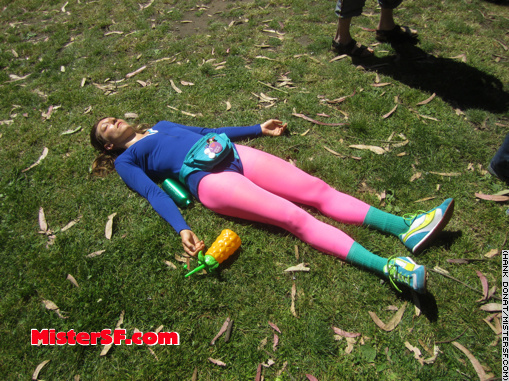 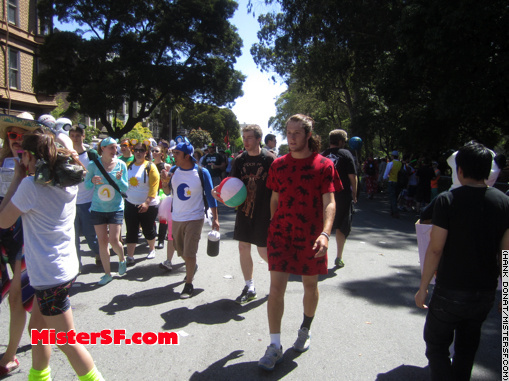 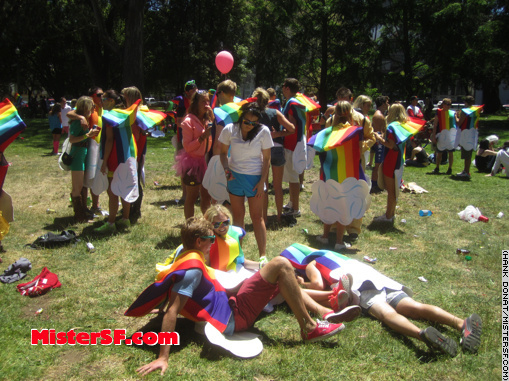 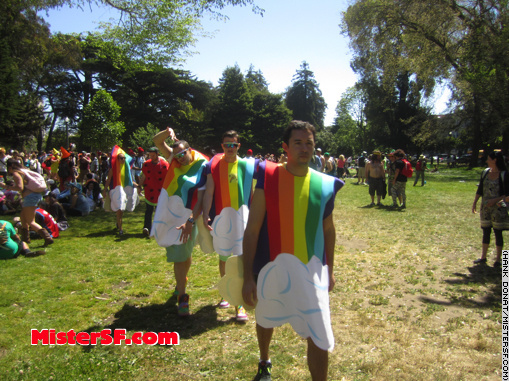 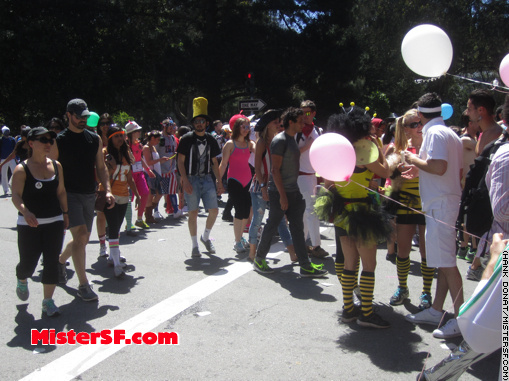 Bay to Breakers brings back memories of Octoberfest – but only for those who participated in neither. 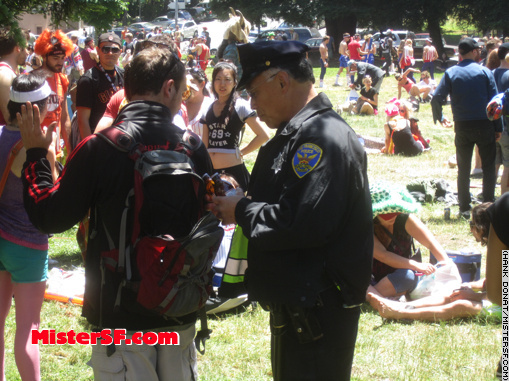 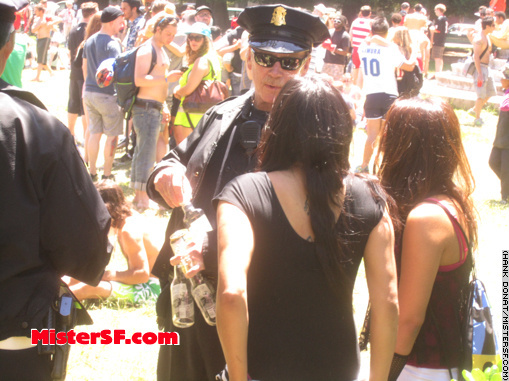 Never one to mistake youth and vitality for public intoxication, Mister SF turned his lens on the Panhandle, where complaints throughout the years have been particularly numerous. 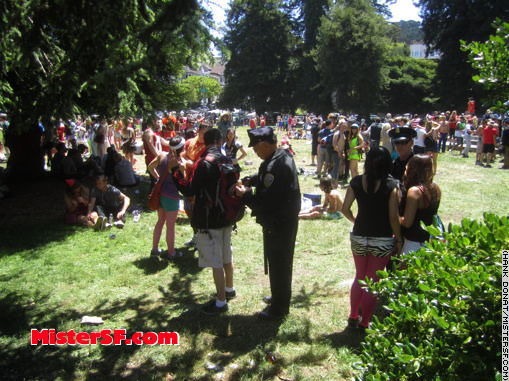 The fast clean up is always an amusing sight when you can catch it directly behind the waning crowd. 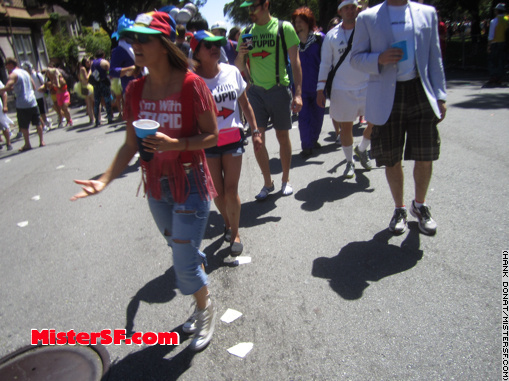 Workers closely follow the race, sweeping up debris like the cleaning fairy in the Fractured Fairytale cartoons. 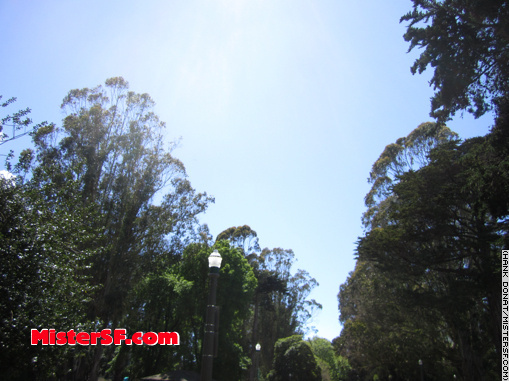 So glad to see a new post. 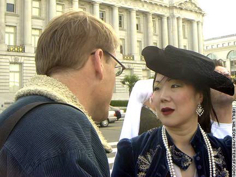 Always a fan of MrSF.